Wits Inn Recovery is now refering clients to Dr Suzie Schuder a board cetified Psychiatrist who is questioning the use of phycotropic medication in some cases. Her holistic aproach is to us cortisol. 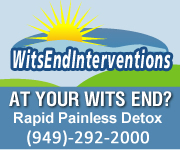 Wits Inn Recovery is now referring our addiction and mental health client’s to Dr Schuder. Her Holistic treatment of the adrenal gland with cortisol replacement may take the place of psychotropic medication in many cases. Cortisol is know to improve stabilization in the treatment of addiction, alcoholism, stress and depression, weight loss, and helps to slow aging. You can see Dr Schuder MD with the help of “Wits Inn Recovery” a treatment referral source. Love and respect Intervention is one of our specialties. Wits Inn Recovery offers addiction and alcoholism treatment, rapid detox, California Rehab, Orange County Sober living, Wits Inn Recovery works with dual diagnosis, PTSD, ADD, ADHD, ADD, OCD, as they relate to drug use, alcohol use. Wits Inn Recovery will find you a treatment center or clinician that is different than what you had in the past. Wits Inn Recovery will walk you through your insurance coverage, or cash budget to get the treatment you need, and want, that fits how much you can spend. taken into account in a medical or psychiatric work-up, so persons with mild to moderate cortisol insufficiency are for the most part relegated to receiving a psychiatric diagnosis when, in fact, the same disorder is represented. However, the symptoms of cortisol insufficiency appear to closely parallel such psychiatric disorders as post traumatic stress disorder (PTSD) and addictions. There has been some question of whether substance abuse causes a hypocortisolemic state. patients having a total reversal of psychiatric symptoms. It is therefore reasonable to evaluate and treat hormonal insufficiencies with hormones prior to using psychotropic medication. Could cortisol insuffiency be what is making you relapse over and over, When you want to stay sober? Could you ever get off of your psych meds and be OK, maybe even beter than ever. Wits Inn Recovery is a drug and alcohol program. We specialize in treatment refferal services, inpatient rehab, interventions and rapid detox. We have on site interventionists, doctors and counselors.